Karnataka 2nd PUC Supplementary Time Table 2019: Department of Pre University Education, Karnataka announced the II PUC results on 15th April. Aspirants who have appeared for the 2nd PUC exams in the month of March can check the result from the official website, karresults.nic.in. Students who do not get the good marks or qualifying marks in the exams can apply for supplementary exams. The Karnataka DPUE recently announced the Pre-University Course Supplementary exam time table. All the hopefuls waiting to check the II PUC Supply time table can visit the official portal, pue.kar.nic.in and download the date sheet. For the reference of aspirants, here we have given the Karnataka 2nd PUC Supplementary time table 2019 download link at the end of this article. By tapping on the link, students can easily download the time table and refer the dates. Students can check the detailed information regarding the dates, application process, and other details from the following article. Karnataka Department of Pre-University Education (DPUE) offers the Pre-University Course for students of the state. The University regulates the syllabus pattern, conducts the exams, and releases the results in time. Lakhs of hopefuls are pursuing PUC under DPUE Karnataka. The board offers various specializations such as maths, science, and economics streams in PUC/12th Class/Intermediate. Every year the PUE Karnataka conducts examinations in the month of March and rolls out the results in April/May months. DPUE Karnataka conducts the supplementary examinations in the month of June. All the students who have checked the II PUC Results on 15th April can view the supplementary date sheet if required. Students who have the requirement of writing the supplementary examination can check the Karnataka II PUC Supplementary date sheet 2019 for science, arts, and maths streams from the official website, pue.kar.nic.in. Karnataka PUE released the Karnataka II PUC Supply exam dates in a PDF file. Students can download the file and observe the dates from it. The PDF file also contains the information of supplementary exam fee per each subject, how to pay the fee, how to apply for supplementary examinations, and other key points in it. As per the scheduled date sheet, Karnataka PUE is going to organize the supplementary exams from 7th June onwards and the exams will be completed by 18th June. Candidates who are going to apply the II PUC Supplementary/betterment exams can check all the details clearly and follow accordingly. For the reference of aspirants, here we attach the PDF file at the end of this page. Click on it and it gets automatically downloaded. Open the PDF file and go through it for complete information. 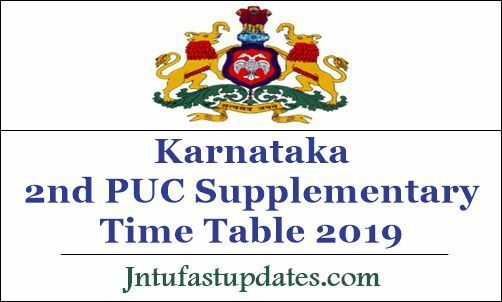 On the homepage, search for Karnataka 2nd PUC Time Table 2019 PDF File. The file will be downloaded in PDF format and opens in another tab. Go through it and take a printout for further reference.